WAYS, in partnership with The Haitian Baptist Convention, invites you to join them on Oct. 27-Nov. 3, 2012 to help with construction of a chicken farm to help feed children living in an orphanage, or to help with programs and activities for the children. Those with pediatric therapy or teaching skills are also welcome to provide services to the children. 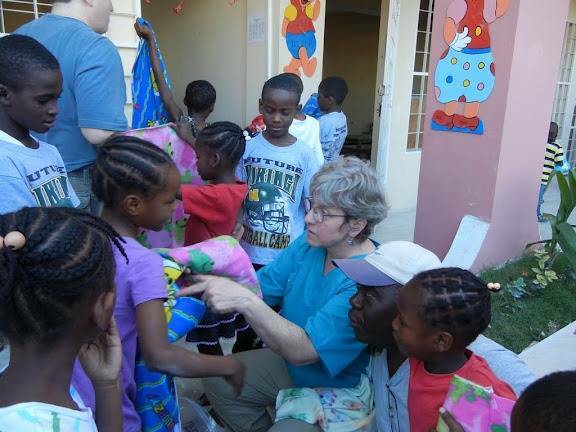 From April 6-13, 2013, WAYS will return to Haiti with a medical team to provide services to children in five schools/orphanages and churches in Port au Prince and surrounding areas. Those with pediatric therapy skills with physically handicapped children and those who are qualified to offer a workshop to teachers in the day school or nurses in the school of nursing, are very welcome. Last year, the Haitian Baptist Convention, with the help of aid from around the world, built a school that offers an orphanage, a day school, a sewing/tailoring class, a computer class, a class in tiling, and a center providing physical and occupational therapy for physically handicapped children. They are about to open a nursing school. In addition, a healthcare pilot program has begun in five churches, each headed by a parish nurse. Now the Haitian Baptist Convention wants to build a chicken farm to provide food for children living in the orphanage. A consultant trained by Heifer Project will oversee the project to insure its success. The cost of the trip is $1300 (which includes room, board, translators, local coordination, ground transportation, leadership costs and a contribution toward needed medicines and material costs). The cost of airfare is about $600. Click here for the WAYS blog, with much more information and a downloadable flyer and application. If you would like more information about either trip, or if would like Shantia to visit your church and speak about the Haiti projects, contact coordinator Shantia Wright Gray at 508-450-2001, shantiawg@gmail.com.